Regular planning permit applicants may have noticed that permit application forms are no longer available from the planning.vic,gov.au website. From 1 March 2018 applicants will be required to source application forms from individual Councils. Clause 1 is hopeful that this change will not result in individual Council’s creating a plethora of unique forms with differing requirements for applicants to navigate. Fingers crossed. Regular users of Victoria’s planning scheme should be familiar with both ‘incorporated documents’ and ‘reference documents’. Any incorporated documents are listed at Clause 81.01 of the relevant planning scheme. Reference documents are generally listed at the end of the policy to which they relate. But what’s the difference between an incorporated doc and a reference doc, and why does it matter? For permit applicants, the most important difference between ‘reference documents’ and ‘incorporated documents’ is the weight they are given in decision-making. Because incorporated documents go through a planning scheme amendment process, including public exhibition and panel hearings to be incorporated into the planning scheme, they are given more weight than reference documents. The departmental practice note relating to incorporated documents suggests that they carry the same weight as any other provisions contained in the planning scheme. Bass Coast Shire: Cape Paterson Management Plan, Shire of Bass Coast. Campaspe Shire: Campaspe Local Floodplain Development Plan; Precinct of Bendigo (Picaninny & Mount Hope) Creeks, Goulburn Broken Catchment Management Authority, North Central Catchment Management Authority and Campaspe Shire. Stonnington City Council: Burke Road Glen Iris Level Crossing Removal Project, Incorporated Document. In contrast, reference documents generally provide background information to assist in understanding the context within which a provision has been framed and are not required to endure the planning scheme amendment process. Rather reference documents can simply be documents approved by the local council and ‘referenced’ in the planning scheme. And should be given very little weight, if any, in decision making. Moonee Valley City Council: Moonee Valley Next Generation 2035 Community Vision, referenced at Clause 21.05 Housing. The important point for permit applicants to take away is that incorporated documents are given more weight than reference documents by Council and VCAT in determining your applications. Applicants should consider relevant incorporated documents when preparing planning permit applications – especially if the local policy is a little light-on in support of your proposal. Does a fire causing significant damage to heritage buildings undermine the ability of the Tribunal to hear an Application for Review lodged prior to the fire? This question was recently answered in an interesting ‘Red Dot’ decision: Caydon Cremorne No 2 Development Pty Ltd v Yarra CC  VCAT 85. The subject site is the former Richmond Maltings site, well known for the existing tall silos and the heritage ‘Nylex’ sign. retained a heritage architect to liaise with Heritage Victoria regarding further repair/reconstruction or demolition. Objectors submitted that the appeal hearing should be postponed because the full extent and impact of the fire was not known, and because the possible loss of one of the buildings had a major impact on the site’s heritage planning. It was argued that the application proposal within the now fire-damaged building, were positive aspects of the proposal. Because those aspects were in question while the fire damage was being determined, the Objectors argued that the Tribunal was not able to undertake its required ‘balancing exercise’ in making a decision. 35 …Issues about the retention or removal of building B6 because of the fire damage will need to be resolved by the applicant, the relevant building authorities and Heritage Victoria. We have no jurisdiction about these matters. 36 There is no prejudice to any party flowing from our consideration of the proposal in its current form. The configuration of the proposed 14 storey building above the fire damaged B6 building has not changed. Whether there needs to be changes to the envelope and configuration of that building, and of the fire damaged heritage building, procedures are available under the Planning and Environment Act 1987 to allow for the consideration of those changes, if they are found to be necessary. 37 Whether the consideration of those changes (if any) occurs by way of secondary consent or by some other mechanism (section 72 or 87A) is to be determined at the appropriate time, and will be influenced by the nature and magnitude of any changes considered necessary. The Tribunal considered the proposal as per the application plans, acknowledging the rights of the permit applicant to request amendments to the plans at a later stage, should the extent of fire damage require alterations to the approved plans to be made. These tid-bits are part of the regular contribution made by Clause:1 Planning to BDAV News. 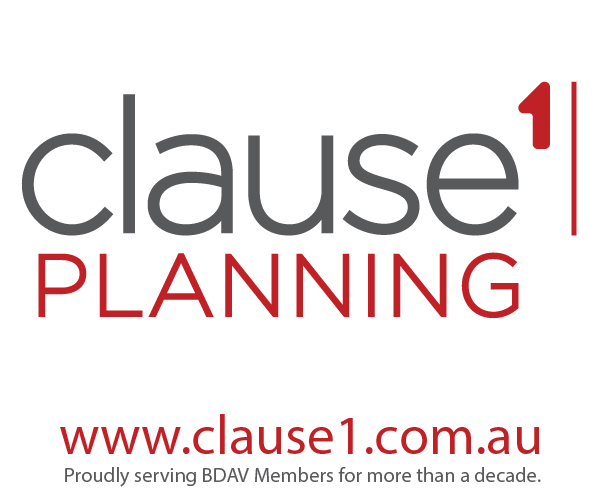 For more information, contact Ashley Thompson on (03) 9370 9599 or visit Clause 1.